In case you didn’t know (or if you need encouragement or a push! ), I’m a huge fan of online dating! I really want to share a bit more of mine and Rob’s story – and to potentially give any of you out there some hope or encouragement, if you might want some. Rob and I met online (seriously, a billion thanks to Coffee Meets Bagel), and I am so proud of our story and we own it quite well. It’s perfect because it’s ours. Honestly, I barely remember that we met online, and whenever people ask how we met, we enthusiastically share all the details. Sometimes it seems like online dating can be taboo or for someone who’s desperate… all things I’ve thought before – ha! I also had tried for SO. LONG. to wait patiently for the Lord’s timing and to be satisfied + joyful while waiting for the right man and to find contentment in my singleness. I gave online dating a half-hearted one month try about four years ago (when I lived in DC), and had tried to resist online dating for much of my adulthood. I wanted to meet the right guy at church, ideally, or through a friend or while riding the metro or something “in real life.” Online dating kept coming up, though, as my best friends gently urged me to give it a shot, if I wanted to… but I never felt like the Lord was really pushing me to give it a try. So Rob and I thankfully met online, which again shows how the Lord’s plans and perfect timing are always, always better than my own. I’m eternally grateful that I put myself out there, that Rob decided to stay on Coffee Meets Bagel for one more week, enabling us to be matched. We both LOVED each others’ profiles + pictures from the very first moment, and our first date was amazing, simple, and special. Our second date was planned during our first date, and we were always so happy + so comfortable with each other; talking for hours nonstop. It was shortly thereafter that Rob asked me to be his girlfriend… and now, of course, we’re married!! Thinking back, our paths may have never crossed, since we essentially had no friends in common and because we went to different (yet similar!) churches. I’m just so glad we were both open to listening to what God wanted for us and that we gave online dating a shot… my life is forever changed! And currently, ELEVEN of my closest friends in the world are married, engaged, or seriously dating a man she met online!! Truly, there are some incredible people out there if you’re willing to put yourself out there and take a little step outside of your comfort zone. Do it! Trusting that He is in ultimate control is what really matters, and knowing that He wants what is best for your heart… even if it takes a few years longer than you had hoped for. Joy comes (not always, but it does) in the waiting and in the trusting and in the “in between.” I turned 30 less than one month before our wedding day, but I’m SO happy and content with where I am in life, even though I had once wished to have been married years before. Rob always reminds me that our timing is perfect for us, and we’re now the man/woman we were meant to be when we met each other. Our story is forever my favorite! 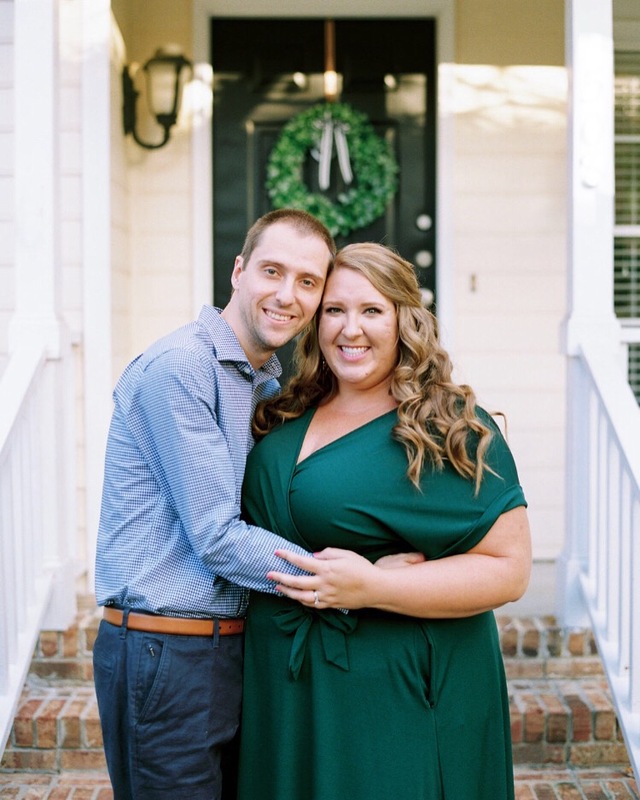 I hope sharing a little about how we met and my thoughts on online dating may be somewhat helpful to at least someone out there… even though I have fleetingly felt “behind” for getting married at 30 (hello, this is the South! ), I have come to love this. Because I know it’s what the Lord had planned all along and because it’s our love story! PS: I shared a some more details about how we met and the early days of our dating (and our proposal!) over on Southern Weddings, if you’d like to read more! You know I would LOVE to hear both your thoughts on online dating: Is it popular where you live? Do you know any couples who met online? What are your favorite apps/website for online dating? And, if you’re in a relationship or married: Do spill! How did you two meet? !